Classic romance and historic architecture was the name of the game for these two. They came to us from beginning, knowing that they wanted to get married downtown with city views, elegant decor and a rockin’ dance party. 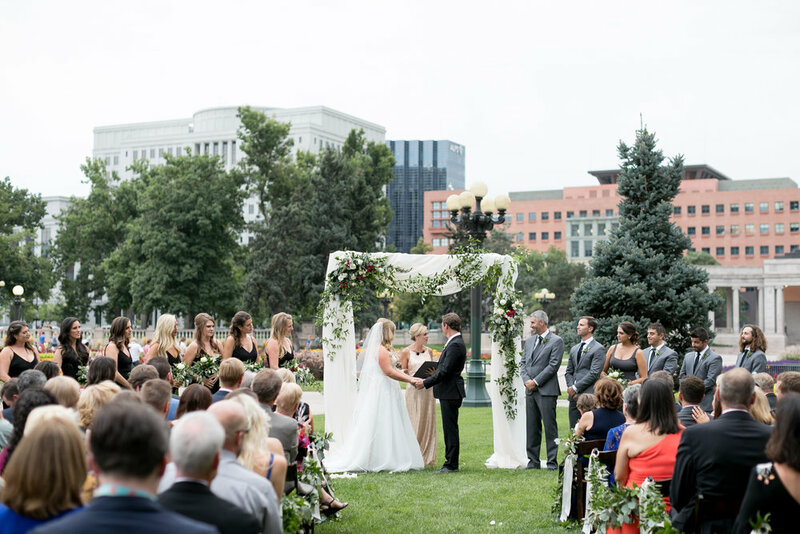 Late August, their 200+ wedding guests were invited to sit in an intimate semi circle facing into the Civic Center park. 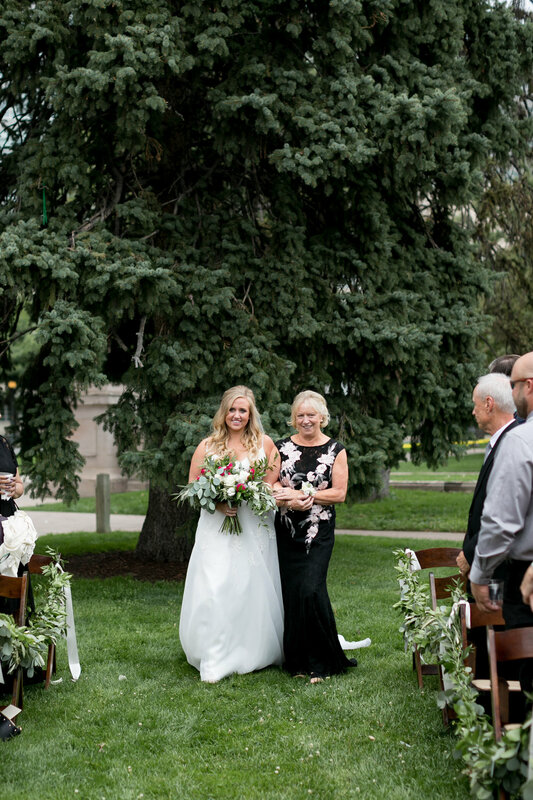 The couple shed some happy tears and expressed their beautiful love in front of an elegant arbor decorated with lush botanics by Kimball Floral. 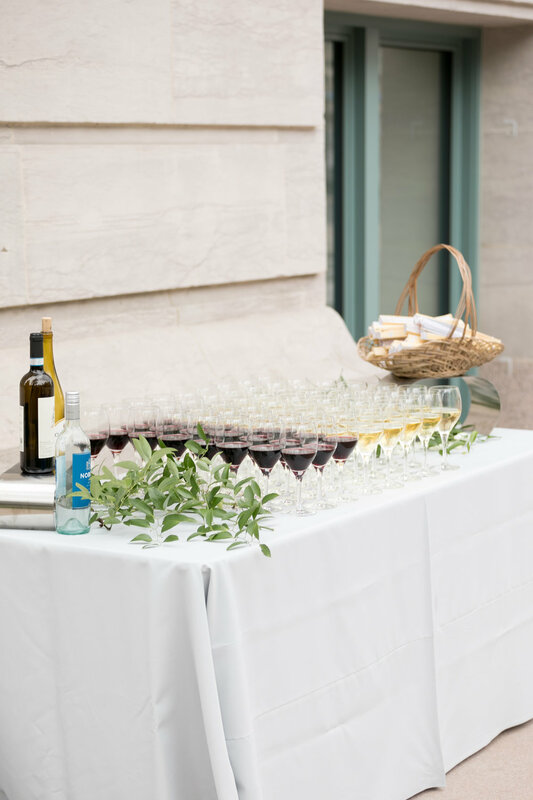 After the ceremony, guests were greeted with a prepured wine bar and passed appetizers on the front patio until Britt and Danny made their grand entrance from the second floor of the McNichols building. What Britt liked to refer to as the princess balcony which was a dramatic and much deserved entrance for these two, for sure. The night was crafted in a modern style plated dinner with simplistic details around every corner. The tables were adorned by warm candlelight, timeless hand calligraphy and vintage style water goblets. After dinner, the couple hired a club DJ to get the party bumping. The dance floor was lit by the glow of their cusom neon sign inspired by their last name and life motto, Clas.